English is the first language in most schools and it is important that children learn to enjoy the languages whether English or any other for what they have to offer and not just as a subject which is a part of the curriculum. Languages form the basis of communication and should be just that. 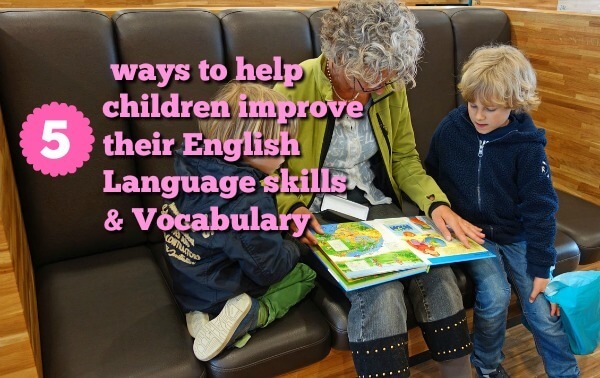 By following these simple tricks at home, we can help our kids develop better vocabularies and better grasp of English language. One mistake that parents often make is continuing to talk in babyspeak even after the baby is able to speak well. Speaking in proper English encourages children to speak in proper sentences themselves thus improving their spoken English. Many of you know that I am an avid reader and I aways wanted my daughter to love books. Thankfully, she too is fond of books and loves reading. Books provide not just the best entertainment, but also enrich the vocabulary in a natural, organic way. Games not just to entertain children but can be used in numerous ways to teach English and increase their vocabulary. Scrabble or crossword is an eternal favourite which is great for improving vocabulary and learn new words. Scrabble encourages children to learn new words and spell them correctly and you get more points for uncommon words. You can also devise your own new games to make learning new words and the language fun for kids. When I was a kid, I remember playing this game with my parents, where we had tell a word starting with the letter which the previous letter ended. There was one more game, where we had to quickly write a name, a place, an animal and one thing with a randomly selected letter. You can make up your own games too. Ms Anu Sanjo, English teacher from School of India, Bangalore suggests some super ways to use games to encourage English speaking and vocabulary enrichment. Dramatics are one of the best ways to let children explore their creativity while also helping them explore and learn the language. Just like stories dramatics allow children to explore their creative side and also enhance their confidence. Children are naturally inclined to pretend play and they are actually acting through out the day. Yes, some children might be more comfortable while performing before people than others and it is all right. Just being on stage can be a big boost. Ms. Anu Sanjo also talks about how dramatics and role play can enhance English language learning in the video. Last but nor the least, stories are the best way to encourage interaction as well as fire imagination in young minds. I tell stories to my daughter all day. We read from books, we make our own stories all the time and now she has started telling her own and changing endings of stories if she does not like or relate to them. Bears find her sleeping on baby bear’s bed. It is our personal experience that stories encourage use of language and not just English and also encourage independent thinking and imagination. To learn interesting stuff about parenting, education, trivia and knowing more about our country, do follow the vibrant community of School of India on Facebook.